Purpose: This study aimed to determine whether excessive neck muscle tone affects hyoid bone kinetics during swallowing using videofluorography (VF) in an unnatural posture in healthy individuals. Subjects and methods: Subjects were 28 healthy adults (12 men, 16 women; mean age, 39.75±9.50 years) without any history or present complaints of swallowing disorders. We first established the participant’s posture a reclining wheelchair that was adjusted to a 30-degree angle with the headrest (without excessive neck muscle tone) or without headrest (with excessive neck muscle tone), used an electromyogram above the mylohyoid muscle to represent the suprahyoid muscles and above the sternohyoid muscle to represent the infrahyoid muscles to confirm neck muscle tone, and then conducted VF of swallowing measurements. 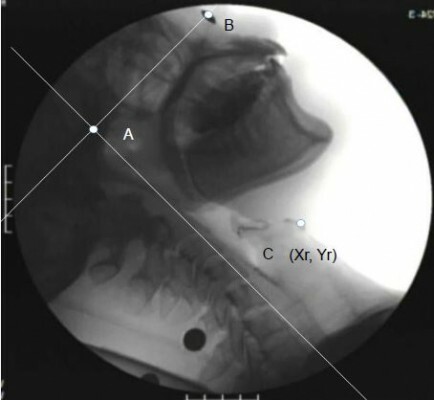 Videofluorographic images were obtained when 5 mL of 50% (w/v) barium sulfate was being swallowed, and hyoid bone coordinate (the resting position and the elevated position), extent of horizontal and vertical hyoid bone elevation, as well as duration and velocity of hyoid bone elevation were evaluated (x-axis and y-axis coordinates for the resting position of hyoid bone are referred to as Xr and Yr, respectively; those for the elevated hyoid bone position induced during swallowing are referred to as Xs and Ys, respectively). Results: In the resting position of the hyoid bone, the Yr coordinates in those with excessive neck muscle tone were significantly lower than in those without excessive neck muscle tone. Vertical hyoid bone elevation and hyoid bone elevation velocity were significantly higher with excessive neck muscle tone than without excessive neck muscle tone, whereas horizontal elevation showed no significant differences. Conclusion: Our findings suggest that the generation of neck muscle tone due to inappropriate posture may encourage hyoid depression and increase the extent of hyoid bone elevation, thereby increasing the risk of aspiration.